The ordinary farmhand found the extraordinary courage to follow his conscience. He refused to serve in Hitler’s army and did not even use the Nazi greeting “Heil Hitler!” Suffering unspeakable cruelty in three concentration camps he grew so thin that he weighed less than sixty-two pounds. Yet nothing and no one could break his will. Astoundingly, he could easily have had his freedom: all he had to do was sign a paper renouncing his religious convictions as one of Jehovah’s Witnesses, but he steadfastly refused. And he never lost his optimism. In the concentration camp, he even bought a suitcase for the journey home it seemed impossible he would ever make. His unshakable faith in God helped Engleitner, now the oldest known male concentration camp survivor in the world, to lead a full and happy life despite constant rejection, and he never lost his zest for life. His unexpected rehabilitation was achieved thanks to an extraordinary friendship. Though already far advanced in years, he has between 1999 and 2008 traveled more than fifty-seven thousand miles across Europe and the USA as a witness of history to ensure the past is not forgotten and has become a model of tolerance and peace. Letters written by Engleitner during his internment and believed lost for nearly sixty years were discovered and, combined with original minutes of police and court proceedings, reports from the concentration camps and traumatic childhood incidents from one hundred years ago constitute an impressive firsthand history. ABOUT THE AUTHOR: Over the past fifteen years, Bernhard Rammerstorfer, has conducted intensive research that has enabled him to produce a historically accurate record of Engleitner’s life that has appeared in a number of publications and films in various languages and countries. Rammerstorfer has given talks with Engleitner at schools, universities, and memorial sites in Europe and the USA, including Columbia and Stanford Universities. 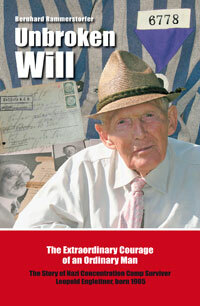 If you want to place an order for the book "UNBROKEN WILL" or for the DVDs, please click here.